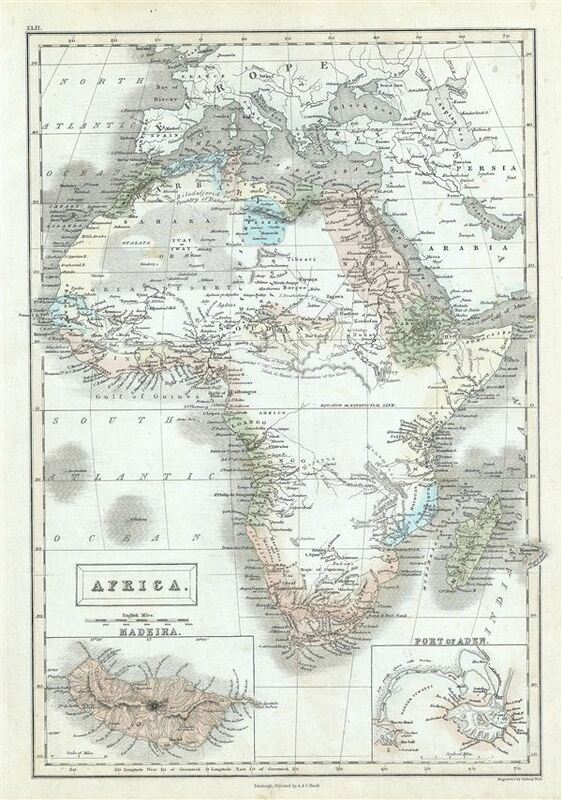 This is a fine example of the Adam and Charles Black's 1851 map of Africa. It covers the entire continent from the Mediterranean Sea to the Indian Ocean and the South Atlantic, including the island of Madagascar. An inset map in the lower left quadrant details Madeira while another inset in the lower right quadrant details the Yemeni Port of Aden. A large portion of central Africa remains unexplored though the Sahara or Great Desert is beautifully rendered. The present map exhibits various speculations regarding the unexplored interior of Africa. The course of the White Nile shown here is speculative at best, the apocryphal Mountains of the Moon stretch across the continent, and what appears to be either Lake Malawi (Nyasa) or Lake Tanganyika is marked 'N'yassi, or the Sea.' The cartographer correctly identifies Lake Chad, while a region in modern day Algeria is marked 'Bileduljerid or the Country of Dates.' Several indigenous African tribal kingdoms are identified along te coasts. Various towns, cities, deserts, oases, mountain ranges, rivers and several other topographical details are noted with relief shown in hachures. This map was engraved by Sidney Hall and issued as plate no. XLII in the 1851 edition of Black's General Atlas of the World.